Bottom line: Mrs. Clinton violated the Federal Records Act. She would not be able to continue as Secretary Of State. Democrats want to make her President. Here is the bottom line about the U.S. Department of State’s Office of Inspector General’s Report regarding the use of email by the Secretary of State’s Office: It does not look good for Hillary. Not just in the political sense, but in the legal sense as well. The pundits seem concerned that Clinton refused to be interviewed by OIG investigators. Sure it’s troubling, but she’s involved in a FBI investigation, and her attorneys likely advised her not to talk. That’s not the issue. 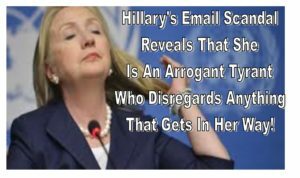 In addition, conservatives have said over and over again that the difference between Clinton’s email usage and that of former Secretary of State Colin Powell is that she had a private server. But again, the pundits are missing the point. The fact that she kept a server made it worse, but both Clinton and Powell clearly violated federal record keeping rules by not turning over copies of their emails when they left office. “Secretary Clinton should have surrendered all emails dealing with Department business before leaving government service, and because she did not do so, she did not comply with the Department’s policies that were implemented in accordance with the Federal Records Act,” the audit report said. Bottom line: Mrs. Clinton violated the Federal Records Act. However, what is probably the most troubling about all of this is that, despite these blatant violations,there will be absolutely no legal repercussions for Mrs. Clinton for this offense. She’s off the hook! Why aren’t all the pundits screaming about that? As Metcalfe pointed out, The Federal Records Act, if violated in this way, does allow action to be taken against a government employee– but only administrative action. Both Clinton and Powell are not in office, so they can’t be punished. As for the Freedom of Information Act, there are sanctions provided under (a)(4)(F)(1), but again, those penalties only apply to someone who is still working for the federal government. While there are consequences if you are found to have intentionally destroyed federal records, the audit did not make a finding that this happened. So maybe that’s true, yes, even Colin Powell violated the rules, but the real problem that neither Ryan nor Clinton will address is that there is nothing to prevent this from happening again! This law was put in place to ensure we have a proper record of how our politicians are handling the most important matters that concern every citizen, and, maybe more importantly, to promote transparency. Ryan is quick to condemn what she did as “deliberately” breaking the rules. But, if it’s so bad, why aren’t politicians like Ryan pushing for sanctions that would hold her (and other politicians) accountable even after they leave office?